During World War II, only one bomb fell on the town of Stirling. Unfortunately for the football team that played there, King's Park, it landed bang smack in the middle of their ground and wrecked the place! 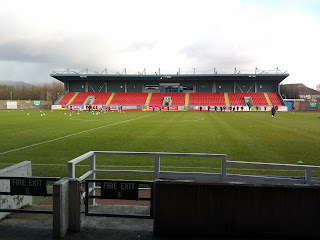 As a result, Stirling Albion, as the club is now known, was founded in 1945 and was the brainchild of local businessman Thomas Fergusson (of Fergusson Coal fame) who purchased the Annfield Estate in Stirling and build the club a new stadium only a quarter of a mile from the town centre. Interestingly, in 1987, this ground was also the first ever to see two Scottish teams play on artificial turf. Anyway, this was to prove a happy home for the Binos until 1992 when the stadium became unsustainable and the team moved to Forthbank – on the banks of the River Forth – where they play today. 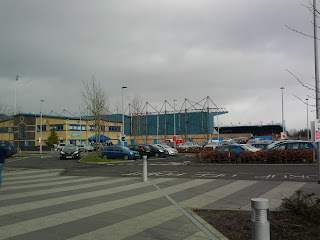 Arriving at the stadium, I was immediately struck by how nice it was cosmetically. I know that sounds a bit stupid but it really is quite a nice stadium to look at! 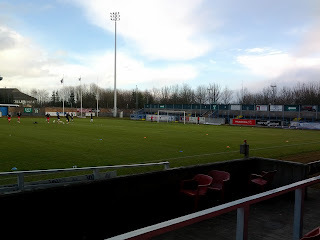 The West and East stands are identical, seated stands and sit opposite each other at the sides of the pitch while the North and South stands are small terraced areas behind each goal. The terraces aren't ordinarily used on match days. Away fans sit in the East and home fans in the West. I took my seat in the West stand and, actually, found it particularly comfortable. Leg room is quite important to me (being quite a tall guy) and there is no shortage at Stirling Albion. You are nice distance away from the pitch, getting a good view of the entire park from more or less any seat. Nothing massively quirky in the Cowdenbeath sense, but nothing massively horrendous in the Cowdenbeath sense either. I think this would be a fine stadium to sit in each week. Perhaps, actually, I was a bit quick in saying that there was nothing quirky. 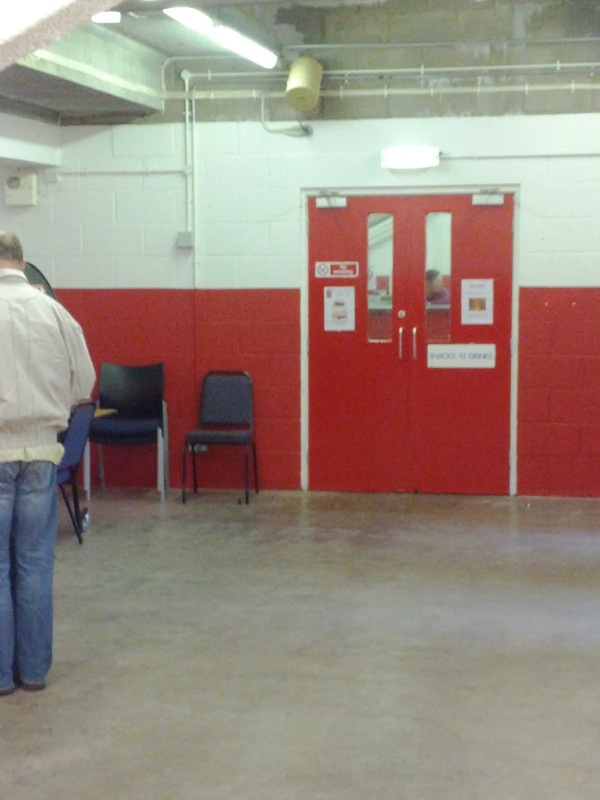 The fact that the catering areas are shut off by a set of doors is rather bizarre. Inside this room, you are also met by a couple of scary women listening to dance music. If I remember correctly, “Fly On The Wings Of Love” by The Olsen Brothers was playing as I ordered by pie and tea! Taste wise, the pie was outstanding. Best I've had probably. Really nice indeed. And the tea, equally so. All this for a very reasonable £2.80. So...nice stadium to sit in each week and tasty catering. Looking good so far for the Albion! Stirling Albion continue to score well when it comes to their fans. They were a good sort to be around with the majority well-educated about the game and well-mannered towards “newbies” and the opposition. A good example being the round of applause that was given to Brechin's Bryan Hodge after he curled home a quite superb equaliser to make it 2-2 in the second half. One thing that's noteworthy is that Stirling Albion has, without question, the highest proportion of fans with spectacles that I've ever seen at a football ground. It was unbelievable! I would say that for every five people that passed, four had glasses. I don't know why it's noteworthy, I just found it interesting! Not only that though, the Binos fans also seemed to love a flat cap and sheepskin coat. Still Game style. Del Trotter style. 1970s football manager style! 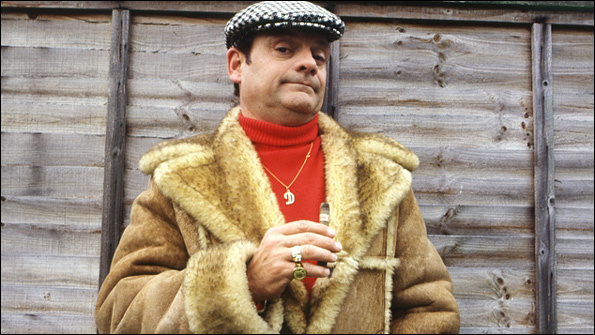 Del-boy Trotter: at Forthbank every second week! So when it comes to fans....Stirling Albion also do well. Hmmm...good fans....good food....nice stadium. They're surely a dead cert for top spot after putting on a five-goal thriller too are they not? No they are absolutely not! In all honesty, I have no idea how the home side even managed to score a goal. I found Stirling Albion to be one of the worst sides I've see this season. They lack any sort of quality across the pitch from goalie Calum Reidford, who seems to be unable to control or kick a ball, to the entire midfield who, at most, strung about 3 consecutive passes together the whole game. 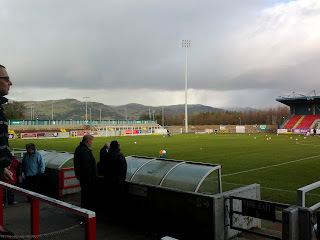 Had it not been for some seriously comedy-cuts defending from Brechin including a goalkeeper error and an own goal, Stirling would have been heavily beaten by a Brechin side that were so much better it was embarrassing at times. The away side really were extremely wasteful, getting in down the Stirling left six or seven times in the first half and misplacing a final ball before getting in pretty much everywhere in the second half and not taking their chances. Graham Weir – the wee man actually had a decent game. He never looked a goal threat (surprise surprise) but he did keep the ball very well, held up play and tried to bring others into the game as much as he could. The boy put in 100% effort and acted as a focal point for his team who were otherwise hapless. Sorry Stirling fans. I may have just caught your side on a bad day. You may not agree with my assessment of the match but I'm just writing it as I saw it at the time and really....it was brutal stuff. With all that said, I've got to score Stirling a reasonable but not outstanding 68/100. They have a nice stadium and excellent fans. Their catering is fantastic. However, if I were to pay £14 each week or commit heavily to a season ticket up front, I'd need something on the park as well and on this evidence I can't see where that's likely to come from. If you're in Stirling for the day and fancy watching a team being heavily beaten on their own patch, head along to watch the Binos! The pies are worth it if nothing else! Can't really argue with that, good read.